Congratulations on your decision to take to the waves! You’re about to join an elite group of 23 million people worldwide who share your interest. The best advice for surfing for beginners is to do your homework before hitting the water. This guide will walk you through the basics of surfing from gear to safety to mastery of that first wave. Let’s begin with the things you need to know first. Stick to Your Ability Level. Respect the Water and the Beach. And it isn’t like anything you’ve ever experienced before. How many times have you’ve done something dangerous? Think of the rush athletes like high jump skiers or mountain bikers must feel. That’s part of the reason that it’s so addicting. When you step out onto the wild side, all bets are off. The benefits also exist on the mental front too. Can you imagine anything more peaceful than being one with the water? It’s a great stress reliever that can put your life and its worries into perspective better than anything else. And if you like doing something different and maybe just a little bit out there, surfing is hard to beat. It takes a lot of courage to take that first wave straight on with nothing between you and the water. That’s top gun. The single most important skill you need to learn how to surf is the ability to swim. If you don’t know how that’s where you need to begin. Nearly 4,000 people die each year from drowning, the top reason being unable to swim. But it’s more than just knowing how to do a freestyle stroke. You need to be seriously comfortable in the water. Grubbing or falling in the drink is part of the learning process. If you’ve ever tried snow skiing, you get the picture. Before you drop any cash on gear, it makes sense to see if surfing is right for you. You may have a cool, romantic image of what it’s like. The reality may differ. Look for a qualified instructor or school to take the plunge. You’ll learn in a safe environment with plenty of help around in case you get in trouble. If you like it, then, start shopping for your surfing gear. Invest in quality equipment, especially if you’re sure it’s the sport for you. It’ll make all the difference between a so-so experience and one that has you begging for more. Let’s review what you should look for when buying your gear. You’ll find a variety of types of surfboards, some of which are better for beginners than others. You can expect to pay anywhere from a couple of hundred to a few thousand, depending on the kind, length, materials, and brand. Don’t knock considering a used one for your first purchase. You can find some good deals at surf shops. You can get a few dings here and there repaired so that it’ll look like new. Let’s begin with a discussion of the parts of a surfboard so that you don’t sound like a Barney at the beach. Like any sport, surfing has its own lingo. That applies to how you talk about the water – to your gear – to your maneuvers. What you don’t want to be is a kook, i.e., someone who thinks they’re cool but doesn’t know a drop in from a barrel. We’ll give you a hint. The first one will get you jeers, the second, cheers. Let’s begin with your board. The front of the surfboard is the nose, while the tail describes the end of it. The sides where you hang onto it are the rails. They may be either rounded or squared off. They are called soft and hard, respectively. You may also see some that are a bit of both called 50/50. The more foam the rails, the more buoyancy the board will have. The bottom of the surfboard is the part that touches the water. Most often, you’ll see that it has a double contour shape with a single one toward the nose that morphs into a double contour toward the tail. The design improves its maneuverability in the water. You may also see flat bottom boards which are a good choice for heavier individuals. There are also channeled surfboards which are geared more toward the experienced surfer. The same applies to V-shaped ones for taking on the big waves. The support going down the center of the board is called the stringer. The side where you stand is called the deck. Often you’ll see this with traction pads or deck grips. They add to the stability you’ll have standing on the board. They will also increase your maneuverability. The thing—or things—on the bottom of the surfboard that looks like a rudder is the fin or skeg. They what keeps you moving forward in the water. They may be permanent or removable. They come in a wide variety of sizes and shapes, each with a different influence on how the board handles. There are three measurements you should know: base length, depth, and rake. The base length describes the widest point at the bottom of the fin. The longer it is, the greater the speed. The depth measures the fin from the base to the tip. You’ll get more control out of your board with a longer depth. Finally, the rake or sweep is the angle from where the fin tip curves over the board. Your ability to take tight turns increases with the size of the rake. Shortboard: These surfboards or thrusters run about five to seven feet in length with anywhere from two to five fins on the back underside of the board or tail. The front or nose is pointed. It is the most popular type. Fish: These are similar to the shortboards only a bit wide and typically under six feet. They also have a pointed nose and a tail that looks like a chunk is missing with two points. Pop-out: This style of board is a good choice if money is a factor. They consist of a foam core with a fiberglass covering. Longboard: The longboard or malibu, mal for short, runs upward of nine feet or more. Unlike the previous ones, it has a rounded nose and usually a single fin on the tail. They are thicker and, thus, more durable. Gun: Gun as in bringing out the big guns are even longer than longboards and are meant for major wave action. You can also opt for a customized board to tweak the design to your preferences. Needless to say, you’re talking more money. If you really get into surfing, it’s something you can consider getting to get the most out of the sport. As with board shapes, you’ll find differences in the construction of surfboards that make better entry-level boards. Polyurethane foam is one of the most popular choices because it strikes a good balance between durability and cost. The material is shaped and coated with fiberglass and resin to increase its strength. Your greatest challenge when starting out is keeping your balance on the board. That means opting for one that will give you the best sense of stability. It’ll help boost your confidence as you build your skills. The best type of beginner surfboard is a malibu foamie. This board has a large surface area to make it easier to stay standing on it with the softness of the foam core. Generally, a larger board is a better choice for a bigger person simply because of the weight distribution and weight to surface area ratio. Speaking of that, a surfboard can weigh anywhere between six or seven pounds to something approaching 20 or 30. An extra-long gun can top 100 or more, depending on the material and construction. You’ll find boards in all kinds of styles, patterns, and colors. The choice is up to you, of course. We will add this one caveat to keep in mind: a brightly-colored board is easier to spot from the shore in case you get into trouble. Just saying. Wetsuits are made of the same material used in drysuits, namely, neoprene. Both provide thermal insulation and help with buoyancy. The difference is that a wetsuit allows water to enter whereas the drysuit keeps it out. The latter is more appropriate for diving in frigid waters and can be quite uncomfortable if it’s warm. If you or someone in your party shows these signs, seek medical help immediately. Hypothermia is potentially life-threatening. Wearing a wetsuit can help prevent its occurrence. That water that comes in contact with your body will warm up and provide an insulating layer to protect you. You’ll find them with short arms and legs, known as a shorty. The full-length suit goes by the moniker, steamer. Which wetsuit you choose depends on where and when you plan to surf. It all boils down to your tolerance and temperature. However, also remember that active muscles produce a lot of heat. You may find that the adage of layering works well in the water too. Wetsuits come in different thickness based on the water temperature. They run from 2mm which is appropriate for water around 60 degrees Fahrenheit to 6mm for temperatures below 40 degrees. You can expect to pay around $100 for one suitable for surfing. A steamer will cost $300 or more. You’ll see wetsuits rated by a fraction as in a 3/2 millimeter wetsuit. The first number refers to the thickness of the neoprene that covers your midsection. The second denotes the thickness around your arms and legs. The difference gives you more freedom of movement and greater comfort because your limbs will be active while you are learning how to surf. In addition to the wetsuit, you’ll need a rash guard to protect your skin from chafing. Your suit should have a snug fit which means it may cause some rubbing, especially at the seams. It’s not hard to imagine how that’s going to affect your time out in the ocean, i.e., saltwater. You can think of it as something like thin thermal underwear. It’ll provide some added warmth too. Wetsuits require some special care to get the most out of your investment. It’s also a matter of aesthetics. A clean wetsuit makes for happy surfing companions. The foremost rule is to rinse it after every single use. It doesn’t matter if you surf in freshwater or saltwater. Sand rubbing against your skin is going to hurt either way. The next important thing is helping it to dry quickly to avoid bacteria or mold formation. Turn it inside out first before worrying about the outside of it. If you have to wash it, use a soap that is specially made for wetsuits. Whatever you do, never put in the washing machine or dryer. Nothing will ruin it quicker. The long cord that attaches you to your surfboard is the leash or leg rope. It is an essential part of your gear no matter what your skill level. Basically, it is a urethane cord with Velcro straps that attach you to your surfboard. It makes it easier to get your surfboard back if you take a spill. It’ll also protect other surfers from your runaway board. As a general rule of thumb, your surf leash should be at least as long as your surfboard. Beginners should add another foot. The length makes sense, if you think about it. You need enough space to maneuver your board if you fall off so that you can get it in place again. Besides, if you take a tumble, you want it far from your head when you hit the water. You attach it near the tail in an indentation called a leash plug. It hooks onto your ankle with a cuff. We recommend trying it on before you buy it to test its comfort. It may not make a huge difference if you’re wearing a steamer, but it may be another story with a shorty wetsuit where your ankles are exposed. Opt for a board leash with at least one swivel. As you may expect, a leg leash will stretch over time, especially in those early days when you’re learning how to surf. Make sure and get a thicker one which will stand the test of time better. Some may say that wearing one will hamper your ability to get up some speed because of the drag they add to your ride. Our advice is to ignore them. Always wear a leash. Your board is going to need some love too. Unlike snow skis, waxing a surfboard doesn’t help you glide through the water. Rather, it improves your traction on the deck. The procedure for applying it is similar. You’ll wax your board before you go and hit the waves. First, remove the old wax using a wax comb and surf wax remover. That part is important. You may find it easier to do if you can warm your board in the sun for a while, especially if the water was cold. The comb will slide through the old stuff a lot easier. Make sure you remove all the little bits. Then, use your surface wax remover to buff it out for the final cleaning. Next, apply your base wax on the areas where you’ll be standing. You should add some horizontal swipes from nose to tail too if you have a longboard. As you work it in, small bumps that are the traction will appear. Then, put on the top coat. 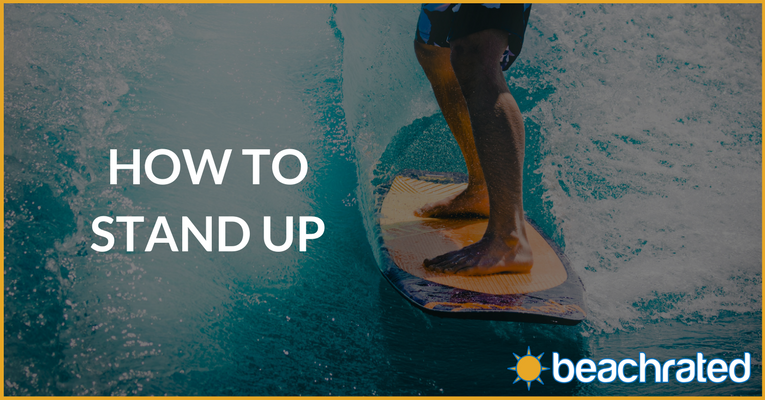 The type of surfboard wax you use will vary with the water temperature. You should completely remove all the wax about every two months because you’ll find that it grips less over time, and needs to be reapplied. You’ll know when it’s happening because it’ll become next to useless for traction. It’s worth noting that you don’t want to get any wax on your wetsuit. It errs on the side of impossible to remove. Bring along whatever you need for a fun day at the beach. There is sure to be some downtime in between sessions of learning how to surf. As we mentioned in the beginning, knowing how to swim is a vital skill for a surfer. But it’s also a great exercise and can help you get into shape for surfing. The better shape that you’re in, the longer you’ll be able to stay out in the water. Surfing isn’t a powerhouse type of exercise like running. However, this sport will challenge you in several ways. Cross training will make it more enjoyable and improve your performance. Your abs will get a serious workout with surfing. Have a strong core is essential to keep you on the board. The plank and its variations are excellent ways to work all of your abdominal muscles for maximum balancing ability. Pilates and yoga are other great workouts that can target these areas and improve your flexibility. Let’s face it. When you learn to surf, there is a lot of aerobic activity involved if just from paddling out to the white water again and again. Cardio activities like running or bicycling can improve your cardiovascular fitness to better manage the physical demands of surfing. You might consider doing a self-assessment to gauge your strength and endurance to target areas where you need to pick up the pace. Aim for at least 150 minutes of moderately intense exercise each week. You can even do short sessions of 10 minutes if you’re pressed for time. Surfing will also tap into the resources of your upper and lower body in ways you probably never thought possible. That’s where strength training comes into play. You should aim for at least two sessions each week and target all of the major muscle groups. That’s not just for surfing. It’ll improve your quality of life and get you that sculpted body you always wanted.To maximize your effort, do exercises that work several muscles such as push-ups or rowing. Flexibility is essential for keeping your balance on the board and for preventing injuries. You will likely find yourself making sudden moves in awkward ways to stay upright. By focusing on flexibility, you can help prevent muscle strain and sprains. Unless you’ve taken an aerobics class, you may not be familiar with these types of exercises. Essentially, they are jump movements. These explosive moves are high intensity with major calorie burn. As a kid, you probably didn’t give jumping rope or hopping off of playground equipment another thought. You were likely in great shape because of it. Plyometrics are an important part of your surfer fitness training because they mimic moves you’ll need to make on the water. They will also work a lot of muscles to get the most out of your workouts. A good exercise to try is the burpee. It has both a cardio and strength element to it. But we won’t kid you. It’s not for the faint of heart. Before you hit the beach, there are several other issues we need to cover so that you can get the most enjoyment out of your time on the water. It’s easy to forget the common sense things you need to do when you’re caught in the excitement of how to surf, so we’ll bring them to your attention. Some areas may be better for beginners than others. It pays to check before you start booking your hotel reservation. You’ll have a better idea of what gear you’ll need and any extra supplies you’ll need to get such as the right surface wax for the water. The first rule of protecting yourself at the beach is to wear sunscreen. It’s especially important when you’re out on the water because its surface will make the UV rays more intense. You should use a product with an SPF of 30 or higher. Apply it at least 15 minutes before you hit the beach. And no matter what the label says, re-apply it every two hours. Accidents happen, especially when you get distracted. You’ll be focusing on so many things at first. It makes sense to build good habits from the start. Before you head out, always check the forecast. Water is a powerful conductor which is something to remember if storms are possible. The same precaution applies to your gear. Make sure everything is in good shape. Never hit the waves without letting someone on land know where you going. It’s not about being overcautious; it’s being smart. When you’re on the water, be aware of other surfers and swimmers. And, of course, you’re using your board leash, right? Finally, always make sure to check the rules. Some places may have restrictions on when you can surf. First, let’s define the terms. Regular means that you surf with your left foot forward. Goofy foot means the right. It’s the same thing as saying you’re either right or left-handed. Despite how the words sound, one doesn’t mean it’s more correct than the other. It’s just a preference. What is important is to know which one is dominant because that one has to do the heavy lifting in the back for steering. You’ll see this expression in other board sports too. You can easily test it by letting your instincts take over with some simple techniques. Try not to think about but let Nature take its course. What you want to find out is which one is more comfortable to you. Once you find out, you’ll have a good tool for improving your stance on the surfboard. Assuming you’ve done your all homework, now it’s time to pick a spot to surf. First, take a look around to get a feel for the ecosystem. Know where people are allowed to surf. Then, see who is out there surfing. As a newbie, you’ll probably want to avoid the places where the experienced surfers are charging it. Instead, look for that nice, quiet spot where there are few others in the water for safety’s sake. Ideally, it’ll have a sand bottom and a visible sandbar for comfortable wading. Know your limits too. Forget the areas where there are steep waves. You’ll only get yourself in trouble. Go for the calmer waves that will be gentler with you. Remember that infamous burpee we mentioned earlier? This is where your time perfecting it will pay off huge for you. It’s a crucial move that you must master to surf. You may find it hard at first, not unlike when you first try to stand up while water skiing. But practice makes perfect. You can practice on the beach with your surfboard once you’ve stabilized it by digging the fin into the sand. Begin by laying on your belly on the board. Place your hands near on either side of your chest as if you were going to do a push-up. Then, pop up into a crouched position in one swift motion. Don’t worry; no one will laugh. Surfers get it. Besides, you’ll build some wicked lower body strength doing this move. Feel free to practice this exercise at home on the carpet. It’s going to take you some time to master this move. If you wait until the surf’s up, you’ll tap your energy stores after only a few shots at it. To reduce the risk of muscle soreness, be sure to take a break between pop-up sessions. There are a couple of caveats. The move you do land is not the same experience you’ll have on the water. Momentum with the wave action and the position of the board will make it easier when it’s time for the real thing. However, it’s still a demanding movement that you’ll need to perfect. And we bet that you’re glad now that you took the time for that strength training. The other thing to remember is that you should avoid ending up on your knees. For one thing, it may hurt. It takes precious time away from getting into position to ride the wave. Everything happens quickly on the water. Before you look for that first wave, you should take time to get comfortable lying on your board. It’ll help you get familiar with how it handles in the water and give you a chance to practice proper technique. This is your chance to get acquainted with whitewater. That’s what happens after a wave has broken. It’s that foamy part that is heading back to shore. Pick up your waxed surfboard and wade out into the water with your leash in place, of course. The nose of your board should point directly into the waves. You should never have it parallel to them. Get on your board when you’ve reached waist-high depth. You should position yourself so that the nose is a bit above the water. Don’t have it so far up that it becomes a wall against the incoming whitewater. Also, don’t let it dip under the water’s surface either. Point the nose toward the shore and enjoy the ride. Don’t get discouraged if you fall off the first few times. Everyone who has tried surfing or paddle boarding for that matter has been there, done that. Proper positioning on the board will help keep you afloat. Just remember that you’re in the game now. Next up is paddling. That’s where all that time you’ve spent on upper body strength training is going to come into play. Keep the nose of the board up a few inches above the water as you head out to sea. The key to doing it right is to use your whole arm, not unlike putting the canoe paddle deep into the water with every stroke. That’s what you’ll do here with your arms. Deep strokes will provide better power. There will be times when you have to speed paddle to get out of the way or to charge past smaller waves. That takes some strength. You should use a freestyle swimming stroke to propel yourself forward. Cup your hands in the water to maximize the move. Make sure that you stay well away from any other surfers, especially those riding a wave. You should take to the whitewater first. You may find yourself in for a shock once you experience how strong it is. That’s why we stress that it’s essential to respect the water. When you’re ready, turn the nose back to the shore and let the whitewater do its thing. You’re almost there to catching your first wave. Next, you need to learn how to stand up on your board. That means doing that pop-up move for real this time. Now, you understand why we emphasized all that training to get ready for the moment. You should try this maneuver in whitewater to take advantage of the momentum and stability. Paddle out to the whitewater. Point your board to the shore as you let it get in front of the whitewater. Then, do the pop-up like you’ve been practicing earlier without coming down on your knees. If you fall, that’s okay. There will be another wave. Be sure to fall away from your board to avoid having it hit you. And above all, don’t panic. Paddle out once more and try again. The next thing you need to learn is to how to get outside the breaking waves. If it sounds scary, you have the proper respect for the water. You’re farther from shore. It’s mission-critical time. Timing and close observation are key skills at this point. You can learn what’s going on around you and be ready to act when the conditions are right. For the smaller waves, you can just charge through them. Your strong paddling will get you pass them. The bigger waves are a different matter. Next, to your pop-up move, the turtle roll is your next major undertaking. It’s something you’ll do when you meet up with larger waves that present too formidable of a barrier. You may think that its description means that it’s impossible to do. But, trust us. There is a method to the madness. In this case, your surfboard is the turtle’s shell. When you’re faced with an impossible wave, head right toward it. Then, turn your board over by grabbing the rails. Hold on tight for that bumpy ride. You’ll go underneath the wave while the board stays on top of it to take the brunt of the force with the fin pointing skyward. Extend your arms to maintain a vertical position. Remember, the wave crashes because it has hit a sandbar or the ocean bottom to slow it down. You’re better off in this spot than on top of it. Did we say to hold on tight? You can push your board forward as the wave passes by to stay with the flow. Then, climb back on your board. We’ll touch briefly on the duck dive which offers another way to tackle a monster wave. It’s a more appropriate technique for shortboard rather than a malibu. Instead of going underneath the wave, you plow through it by lowering the nose of your surfboard. It won’t work as well for a longboard because of its size and buoyancy. Once you’ve mastered standing up on your board, it’s time to graduate to riding the waves. Let’s start with a little background information to put everything in perspective. If you watch the surf, you’ll notice that a wave builds up in height until its momentum changes its course. Then, the action starts. The ocean bottom puts the brakes on the action of the bottom of the wave. The crest, however, keeps moving, causing the cascading effect of a wave crashing. Your task is to get to that critical point where the top is still moving forward to the shore. It’s all about timing. You don’t want to be part of that crashing business, nor do you want to miss the show. The face or shoulder of the wave is the sweet spot. It’s what surfers dream about and what gives the sport its rush. Once you’ve spotted your target, turn the nose of your board back to the shore. Then, get paddling. You’ll know when the big moment has arrived when the surf starts to carry you toward the beach. That’s when you pop-up and ride the wave. You’re surfing, baby! The key to staying up lies with muscle strength. That’s why the workout regime is so important. It also comes with practice. The more you surf, the better you’ll get. You’ll bulk up those muscles necessary for doing quick pop-ups and maintaining your balance. But you also need to be honest with yourself regarding your abilities. Don’t go after those larger waves until you can handle the more manageable ones first. And don’t underestimate the power of the water. Even a small wave packs a big punch. Over time, you’ll build up your confidence to take your surfing to the next level. Our best advice is to practice, practice, practice. However, by this time, we think that you don’t need us to tell you to go surfing. We’d be remiss if we didn’t mention the unspoken rules of the water, i.e., the surfer’s law. Yes, they do exist. The one thing that is certain to rile up other surfers is if you drop in. It’s the aquatic equivalent to cutting someone off, and we all know how that feels. In surfing, it means that the person closest to the peak of the wave has the right of way. And, yes, there is such a thing. But, wait, there’s more! It’s essential to remember that surfing is an extreme sport. It’s often dangerous and unpredictable. That’s why is critical to give everyone plenty of room to maneuver whether the waves are breaking or not. Likewise, don’t paddle too close to anyone or in front of a surfer who is riding a wave. Speed paddle to get behind him and out of the way. Unfortunately, this problem isn’t limited to surfers. Sailors, boaters, kayakers, and paddle boarders also have to deal with this outright rudeness and disrespect. All we can say is c’mon, man! The most dangerous surfing accidents involve that thing you’re standing on. Always hang onto your surfboard. Don’t let it drift away from you into the path of other surfers or non-surfers. Remember that board is also your safety gear because of its buoyancy. If you’re an ace surfer, the last thing you want to deal with is some hotdog who breaks all of the rules of the surfer code. Dude, not cool. That means don’t mess up the experience for anyone else. Stick to the surf that you can handle before treading into big boy waters. It’s not just polite; it’s the safe thing to do. Cutting in front of another surfer doing cutbacks is a sure recipe for disaster. It’s just like back in grade school. No one was thrilled with the kid that won’t let anyone else have a turn on the new swing. Don’t be that guy at the beach. Give other people a chance to enjoy the surf too. It’s not all about you. A lot of places have their own rules of the water. Don’t label yourself a benny, i.e., outsider. Visit the surf shop and get the straight dope on what the locals consider a faux pas or crime against all other surfers. Love your mother, as the saying goes. It applies to the water and the beach too. Don’t even think about littering. Clean up after yourself like you learned in kindergarten. It’s that simple. Other surfing lingo is legendary. It’s descriptive and just a whole lot of fun. To complete our guide on how to surf, we’ll end with some words and phrases to add to your surfing stories. Not all of the terms you’ll hear are ready for prime time. Some are pejorative or downright mean. We’ll stick to the nicer ones. Now let’s move onto some other helpful lingo to know. There’s a lot of overlap between some surfing terms and everyday slang. The chances are you’ll recognize the more common ones. Hang loose: keep it real, dude. Line-up: where you go to wait your turn at the next wave. Quiver: used to describe your collection of surfboards because you can’t have just one. Shorebreak: the place where the wave meets the shoreline; a place you don’t want to surf. Wipeout: something you have to endure in the beginning but hopefully will become a distant bad memory in the future. Surfing has so much going for it. It’ll challenge your endurance and strength. It’ll give you that rush of doing something pretty dangerous. But it’s not easy. It requires great physical fitness to match the unpredictable conditions you’ll like encounter. Learning the basics is just the start. Once you get a taste of it, we’re sure you’ll agree. It’s the beginning of a beautiful friendship. Let’s us know how your first time goes in the comments below!